Mechanical keyboard is a type of keyboard that uses individual mechanical switches for key-press. They are way more expensive than regular membrane keyboards that uses a silicone or rubber domes under the key-caps. Mechanical keyboards are great for typing, gaming and are generally preferred over the membrane based keyboards. It is a fact that you won’t switch to a membrane keyboard after using a mechanical keyboard because they are just awesome and feel great to play or work on. Also, mechanical keyboards reduce finger fatigue because mechanical switches requires less force to register a keypress compared to a membrane keyboard, and also rubber dome keys become more and more harder or resistant with time and requires greater amount of force to press on. There are various types of mechanical switches and manufacturers that makes switches for use in mechanical keyboards. The most popular and reliable switches are Cherry MX switches and it also has various types i.e. Cherry MX Blue, Clear, Red, Brown where each one has their own feel and use. Mechanical keyboards using Cherry MX switches are more expensive and they cost around 100 dollars mark or higher. However, there are some other switch types too (mainly Chinese) that mimic the Cherry MX switches and are way cheaper than them. These switches are generally Cherry MX Clones and they are pretty reliable and offers good mechanical keyboard feel, typing & gaming experience. Some of the Cherry MX clones are Outmeu, Kailh, Gateron, Greetech, Gaote, Razer, Switch Master. You can find easily find a membrane keyboard for as low as 10 dollars but a mechanical keyboard generally cost you around 100 dollars or more. However, there are some good mechanical keyboards that you can find below 50 dollars mark and they are also very good for both typing as well as for gaming. So, here I am going to list down some budget mechanical keyboards that you can get under $50 for both gaming and typing use. If you have a bit more budget then you may also check out these mechanical keyboards under 100 dollars with genuine Cherry MX switches. Here are the best mechanical keyboards under 50 dollars that you use for your gaming and typing needs. Almost all these budget and cheap mechanical keyboards are from Chinese brands. Redragon K552 Kumara is a compact mechanical gaming keyboard. This is a Tenkeyless keyboard that comes with 87 standard keys and 12 Multimedia keys are integrated in the standard keys and can be triggered by pressing the function key (Fn) with the key itself. This mechanical keyboard comes with Outemu Blue Switches that are advertised as Cherry MX Blue Clones but I found that these Outemu Blue mechanical switches have less resistance, sounds differently and are louder compared to the original Cherry MX Blues. The keys do have tactile feedback and the advertised lifetime of these Outemu blue switches is 50 million keystrokes, which is same as of the Cherry MX blue ones. However, they feel good to type on and also performs well in gaming. The font on the key-caps may not appeal to some users but that is matter of personal preference. This is a strong and sturdy keyboard with Aluminum and ABS construction. It has double shot molded keycaps that feels nice and are reliable. The keycaps are lit by Red LED lighting that has got some nice effects too. The RED LED lighting is bright enough and you can also adjust its brightness from the keyboard itself. 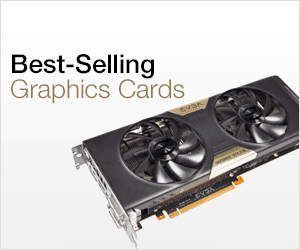 For gaming, it has Anti-Ghosting keys that comes very handy in FPS or eSports gaming. The USB cable is non-detachable which is a bit of a downside but has a got a gold-plated connector for superior connectivity and to avoid corrosion. It does have a splash proof design but my advice is to keep water or any liquid away from it because mechanical switches get damaged due to water or any liquid. Overall it is a great budget mechanical keyboard for work and gaming. The keyboard supports Windows 10, Windows 8, Windows 7, Windows Vista, Windows XP and Mac operating systems. 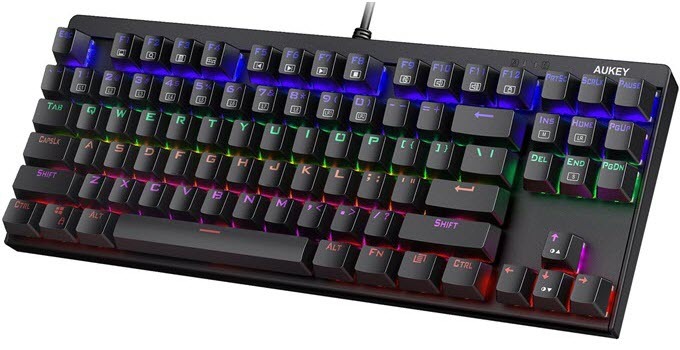 There is also a RGB variant of this Redragon K552 Kumara keyboard that comes at a slightly higher price point but under 50 dollars mark. You can check out both these models by going to the links given below. AUKEY is a brand that is mostly known for its power banks, chargers (wall / car, wireless / solar), power strips, USB cables, adapters, headphones and audio accessories. However, it does offer some cheap mechanical keyboards too and here we have got AUKEY KM-G7 Mechanical Keyboard which is a compact 87-Key LED Backlit keyboard with real mechanical switches. This keyboard comes with Outemu blue mechanical switches which are tactile mechanical switches. The keyboard has got 6-color LED backlighting, 9 preset lighting effects and 2 slots for assignable lighting effects. The multimedia keys are clubbed on the top function keys and can be triggered by pressing the special FN (function) key on the keyboard. This compact and small form factor mechanical keyboard has very clean and minimalist design and it resembles Redragon K552 Kumara to a great extent. It has Anti-Ghosting keys, Double shot molded ABS keycaps, metal construction and has got waterproof design. This keyboard can be use for typing as well as for gaming. The keyboard supports Windows and Mac OS. There is an also a 104-key model available of this keyboard and you can check them both by going to the links given below. If you do not want LED lights then you can get the non-LED plain variants of the AUKEY mechanical keyboards with same specifications. You can check these models having 87-key and 104-keys from the links given below. 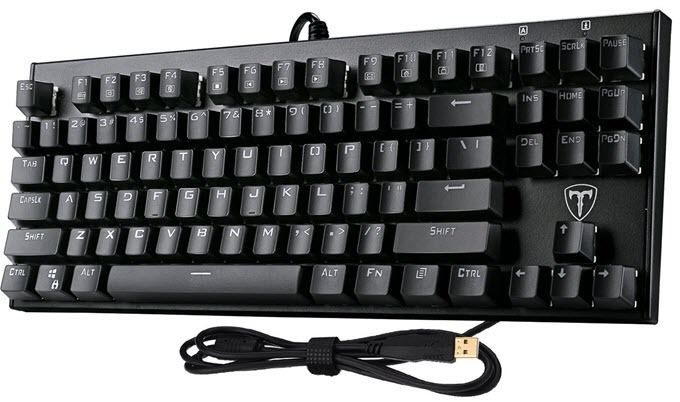 If you want a branded mechanical keyboard under 50 dollars budget with Cherry MX mechanical switches then Gigabyte FORCE K83 is the answer. 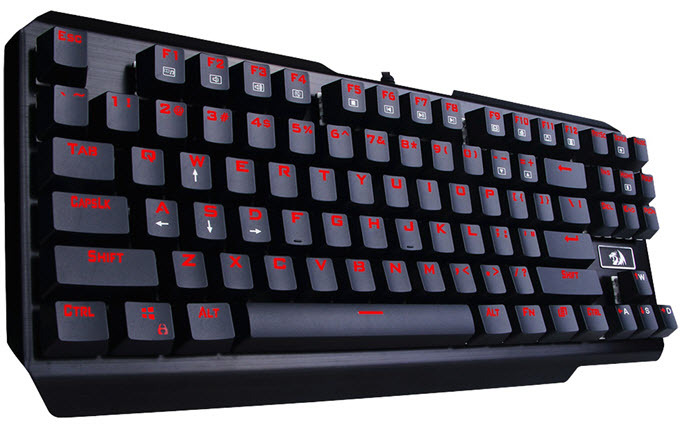 The is a standard 104 keys keyboard and comes with Cherry MX Red switches that are designed especially for gaming. Cherry MX Red switches requires low actuation force and are not tactile compared to the Cherry MX Blues. However, they are pretty good to type on compared to rubber dome keys found in cheap membrane keyboards. This is strongly built keyboard having a classic design and wear resistant keycaps. However, it does lack LED back-lighting but you can surely live without it if you want a quality branded keyboard at this price point. The multimedia controls are embedded on the top function keys which can be triggered by pressing the special function key (fn). The keyboard features Anti-Ghosting across all zones of the keyboard (N-Key Rollover) which makes it ideal for eSports and games that requires multiple key presses at the same time. Other features include Win-lock key, non-slip rubber feat stands and Modern island-style layout. Overall a great budget mechanical keyboard with genuine Cherry MX Switches. Highly Recommended by me. This a Chinese mechanical gaming keyboard that comes with Outemu blue switches. Even being a 104-keys keyboard, it has got a minimalist design and floating keys layout which makes it very easy to clean. The keyboard resembles almost the same specifications and features as that of above mentioned Redragon mechanical keyboard. 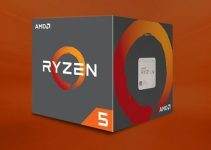 Its features include programmable RGB LED lighting, Metal and ABS construction, Anti-Ghosting keys, Win lock key, multimedia keys, splash proof design and gold plated USB connector. 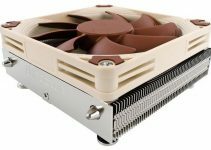 It is compatible with Windows10, Windows 8, Windows 7, Mac OS X, Windows XP, Windows VISTA. Note: This same keyboard is available under different brand name which is MechanicalEagle Z-88. You can check them both by going to the links given below. Another very good Redragon mechanical keyboard for gaming and typing. The difference between this Redragon K553 USAS Mechanical keyboard and Redragon K552 Kumara mechanical keyboard is that in the Redragon K553 USAS the keys are mounted on a solid aluminum metal plate, and it comes with floating keys design which makes it very easy to clean and manage. The keyboard is heavy and is built like a tank. It is unarguably one of the tough mechanical keyboards that you can find in this budget segment. Redragon K553 USAS is a Tenkeyless keyboard having Outemu Blue Switches. It has got 87 keys with 12 multimedia keys inside the function keys and can be called by using the special function (FN) key. It comes with features like metal and ABS construction, Anti-Ghosting keys (conflict free (n-Key Rollover), double shot injection molded keycaps, gold plated USB connector, Win-lock key, RED LED backlighting and splash proof design. The keyboard supports Windows 10, Windows 8, Windows 7, Windows Vista, or Windows XP, Limited Mac OS. I personally own this keyboard and it does perform to its expectations. Overall a sturdy and feature rich mechanical keyboard that you can get well under 50 dollars. This is one of the cheapest mechanical keyboards that you can get for your gaming or typing needs. TOMOKO 87 Key Mechanical Keyboard is 87-keys compact keyboard that has got floating keys design. It comes with Outemu Blue switches which makes it ideal for both gaming and typing. The keyboard lacks LED backlighting but at a price this low you couldn’t really complain. The build quality of this keyboard is pretty great and it is advertised as Water-Resistant or more specifically it has a splash proof design. It does come with multimedia shortcuts which you can engage using the special FN key and top function keys (F1 – F12). It has got N-Key Rollover Anti-Ghosting Keys and Windows lock key that is a necessity for a gaming keyboard. The keyboard is sold by VicTsing which is its parent company. The keyboard supports Windows10, Windows8, Windows 7, Windows XP, Windows VISTA and Mac OS. 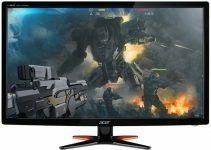 There is also an 6-color LED backlit version available at a slightly higher price but under 50 dollars. You can check both of these mechanical keyboards by going to the links given below. Here we have another AUKEY keyboard but this one comes with Retro typewriter style keycaps that looks very classy and gives a vintage look to it. This is a compact 87-keys keyboard and it comes with Outemu blue switches. The keycaps are rounded and the keyboard features floating key design. These rounded retro styled keycaps may not appeal to some users but some may find it very unique and comfortable, especially for typing. The keyboard lacks LED back lighting which is a bit of a downside for some users. Main features of this gaming mechanical keyboard include Anti-Ghosting keys, Fn shortcut multimedia keys, water-proof design, metal back-plate, Double-shot-molded ABS keycaps. The keyboard supports Windows and Mac OS. This keyboard is also available in 104-keys variant with model number KM-G10, and you can check both of these models from the links given below. A budget RGB mechanical keyboard from Ajazz which is a Chinese brand. This is a compact keyboard with 82 keys which has floating keys design. It comes with custom Black mechanical switches that are pretty good for gaming and typing but are not clicky as the blue ones. Also, these black switches or keys exerts less force than the blue ones which means less fatigue for your fingers. The multimedia controls are integrated on the top function keys and can be called in conjunction with the special function key (FN). This is a full RGB keyboard that supports over 16.8 million colors and has got 18 backlit modes. You can also control the brightness of RGB LED Lights depending on your requirement. The keyboard is pretty solidly built having aluminum and ABS construction, and it comes with N-key Rollover Anti-Ghosting feature for gaming use. The USB cable is detachable which makes it easier to carry around when traveling. The font on the keyboard is easy to read and pleasing to the eye unlike in other Chinese mechanical keyboards. Overall, it is a very good cheap RGB mechanical keyboard for gaming and typing work. It is no doubt that mechanical keyboards are far superior than membrane or rubber dome keyboards, all in terms of reliability, feel, gaming and typing. Even a cheap mechanical keyword is worth getting because they feel so good on your fingers and they also helps in reducing reduce finger fatigue. Most of the cheap mechanical keyboards are from Chinese brands with Chinese mechanical switches because genuine Cherry MX keyboards costs way above 50 dollars. However, these Chinese made budget mechanical keyboards are pretty reliable and offers you amazing performance for the price. If you have any doubts or queries regarding mechanical keyboards then you can ask me your queries by leaving a comment below. Do check out the Ajazz AK33 as well. I got it about a month ago for 22 dollars (on a discount) and it’s pretty awesome. Okay I will do it. Thanks ! You can fix your keyboard chatter by this solution https://graphicscardhub.com/how-to-fix-keyboard-chatter/ and for mouse i suggest you to go for Logitech G102 Prodigy Gaming Mouse. I WILL Try that Guide and use!! thanks for instant reply thanks alot !!!! But Please Suggest Also Keyboard :)) THANKS ALL SO MUCH BIGG !!! Are you looking for a mechanical keyboard? Yes ! mechanical Keyboard !! I NEED HELP I Downloaded software #Keyboard Chattering FIX# I Pressed all keys, can you tell me how to use that i m not bit aware of that :)) After Pressing all Keys, There Are So Many Keys That Showing!! its Down 🙁 Means My Whole Keyboard is Damaged?? and I READ That About Clean, I ALREADY CLEANED KEYBOARD After Taking all key caps , and my Product is not in warranty !! Can I Get Your MAIL ID SO I CAN SHARE SCREENSHOT OF MY LOGS !! SO You CAN HELP ME BETTER!! Please upload the screenshot at https://imgur.com and share the link here. I am not getting you as you have to just follow the instructions given on the guide. It will definitely work. Yes most of the keys have double clicking issues. Just set the threshold value to 90 and then you will not face any issue. Make sure to run this program on startup. Your issue is fixed now?